Mother, I would choose one of three things, that you should no longer be alive, or that you should survive but be called someone else's mother, or that you should somehow acquire a better heart than the one you have! τῶν νῦν παρουσῶν τῶνδ᾿ ἀμείψασθαί ποθεν. Hyllus begins with a striking formulation of the proverbial 'choice of three evils' (a choice between three modes of death or punishment, cf. fr. 908 P & R with Pearson's note and Radt's app. crit. ; Menander fr. 735 K; schol. on Pindar, Ol. 1.60). Hyllus adapts the idea to suit his denunciation of D.: he wishes she were (i) dead or (ii) alive but not his mother or (iii) different from what she is, i.e. not guilty. a This is thought to allude to the story that a consulter of the Delphic oracle might be given his response in an envelope, and if he opened it before an appointed day might lose an eye, an arm, or his tongue. 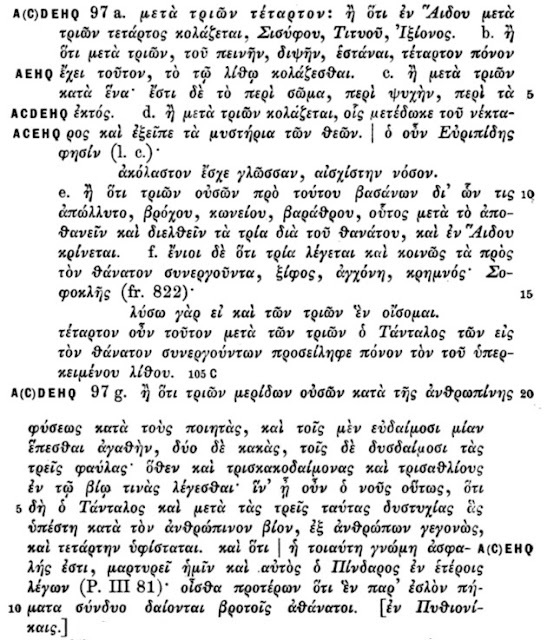 λύσω γάρ, εἰ καὶ τῶν τριῶν ἓν οἴσομαι. For he has one evil of those three. ἓν γάρ τι τούτων τῶν τριῶν ἔχει κακόν. Olympias sent Philip's daughter Eurydice—she was the child of Philip and an Illyrian woman—hemlock, a noose, and a dagger.35 Eurydice chose the noose. 35It was often suggested in antiquity that there were three ways to commit suicide; the idea first appears in Aristophanes, Frogs 118–135, where they are: hanging, hemlock, and throwing oneself from a height. See E. Fraenkel, Philologus 87 (1932): 470–473 (= Kleine Beiträge zur klassischen Philologie I (Rome, 1964), pp. 465–467). Ὀλυμπιὰς τῇ Φιλίππου θυγατρὶ Εὐρυδίκῃ (ἦν δὲ ἄρα αὐτὴ ἐξ Ἰλλυρίδος γυναικὸς τῷ Φιλίππῳ γενομένη) προσέπεμψε κώνειον καὶ βρόχον καὶ ξίφος· ἡ δὲ αἱρεῖται τὸν βρόχον. [Note] that they used to set three things beside those condemned to death: a sword, a noose, hemlock. [These were called] "the three things for death"; but some [called them] the three things by the courtyard. Those who were being led to death were allowed free speech, so that when they were sated with food and wine, they could say whatever three things they wished; then they were gagged. That which is now called archeion ["town hall"] used to be called aule ["courtyard"], and its servants [were called] courtyard-attendants. Elsewhere: "the three things for death" -- Alexis mentions [them] in Goatherds. [Note] that he who prophesies at Delphi used to receive the oracular responses in hints, and it was declared for him, if he should explain [them], one of the three punishments: for he must be deprived of his eyes, or of his hand, or of his tongue. Τὰ τρία τῶν εἰς θάνατον: ὅτι τοῖς εἰς θάνατον κατακριθεῖσι τρία παρετίθουν, ξίφος, βρόχον, κώνειον. τὰ τρία τὰ εἰς τὸν θάνατον: οἱ δὲ τὰ τρία τὰ παρὰ τῇ αὐλῇ. τοῖς ἐπὶ θάνατον ἀγομένοις μετῆν παρρησίας, ὥστε τροφῆς καὶ οἴνου πληρωθεῖσι τρία λέγειν, ἃ βούλονται: μεθ' ὃ ἐφιμοῦντο. τὸ δὲ νῦν ἀρχεῖον καλούμενον αὐλὴ ἐλέγετο, καὶ οἱ ὑπηρετικοὶ αὐλικοί. ἄλλως: τὰ τρία τὰ εἰς τὸν θάνατον: μέμνηται Ἄλεξις ἐν Αἰπόλοις. ὅτι ὁ μαντευόμενος ἐν Δελφοῖς σεσημασμένους ἐλάμβανε τοὺς χρησμούς, καὶ προείρητο αὐτῷ, εἰ λύσει, ζημία μία τῶν τριῶν: ἢ γὰρ τῶν ὀφθαλμῶν αὐτὸν ἔδει στερηθῆναι ἢ τῆς χειρὸς ἢ τῆς γλώττης.